Few businesses take the time to educate their customers, but D & S Sanitation is here to do just that! 1. A Standard System consists of a septic tank and an absorption area. The tank collects water that comes from your household from bath water, toilet waste, dishes and laundry. The solids settle to the bottom while scum and greases rise to the top. Between the surface matter and solid waste is liquid that passes through pipes into the absorption area or lateral lines (trenched, finger-like rows dug underground where the liquid absorbs into the ground below). Micro organisms in the ground then remove the pollutants before the wastewater enters ground or surface water. Bacteria that comes from the materials entering the tank work to break down the scum and organic matter while the inorganic and hard to decompose materials settle at the bottom. By pumping the tank regularly every 2 to 3 years (more or less depending on the size, usage and type of tank) this type of system may work 20 - 30 years providing it was installed properly. 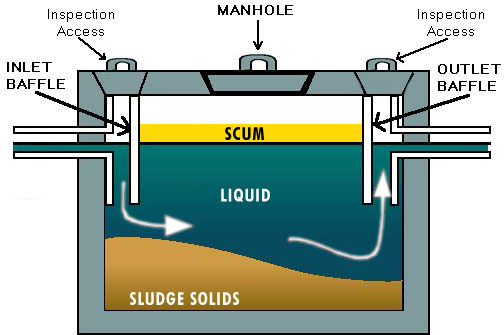 Without proper pumping, the sludge layers increase, filling the tank's capacity, which will eventually cause an overflow into the absorption field, clogging it and causing a system failure . No additives can clean out the sludge. Clogging can only be prevented by thorough and regular septic tank pumping. 2. An Aerated System is just like the Standard systems, except they include a motorized fan which is added to increase the air flow in the tank to speed up or maximize bacterial production. Most newer systems are being built with fans, but these systems also tend to require more frequent pumpings. 3. Lagoons are pond areas set aside and fenced for safety where sewage is drawn from the house and collects. Some lagoons have an added septic system and some do not. Lagoons require pumping if not property maintained. The difference between having a septic system and a lagoon is that lagoons are above ground and are openly exposed which can encourage flying insects and other pests.